It was only fitting really that the sun was shining on the SUNGRL’s birthday. To top that off Steve even remembered to say Happy Birthday when he opened his eyes – he has been known to need a gentle reminder in years gone by! Karin, Elvis and I went for a run and followed it up with another awesome swim in the Lake. 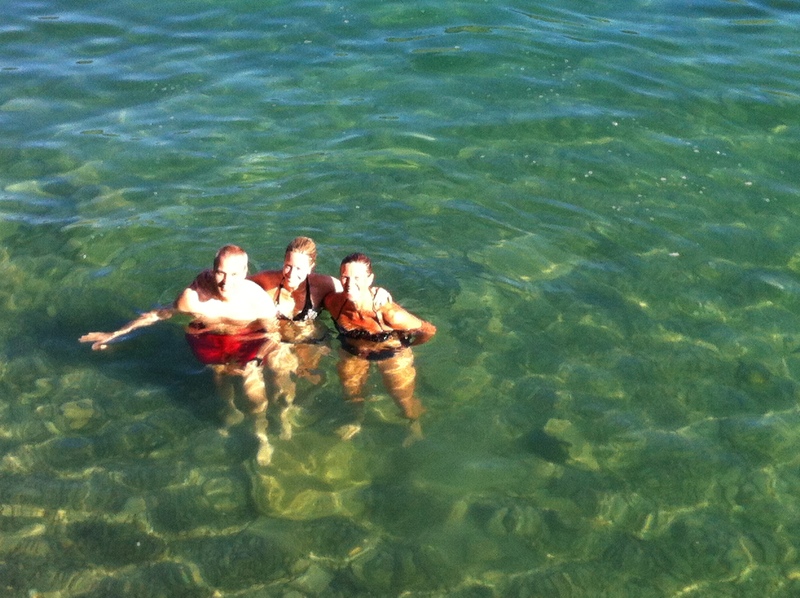 You just can’t beat swimming in a fresh water lake. The breakfast table was lovingly decorated with fresh flowers from the garden and we enjoyed fresh fruit smoothies and fresh bread whilst overlooking the lake – a nice leisurely breakfast. 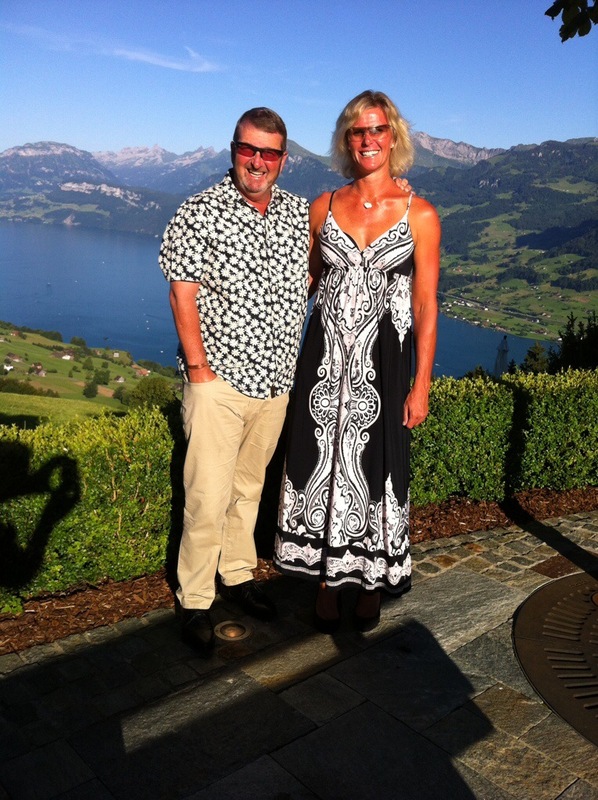 It was then off to the driving range – after a couple of months with no golf we were feeling a bit rusty. We had been to the range earlier in the week so this was round two of freeing the rust. Steve was also teaching Karin & Elvis to hit balls so we all had a lot of fun. 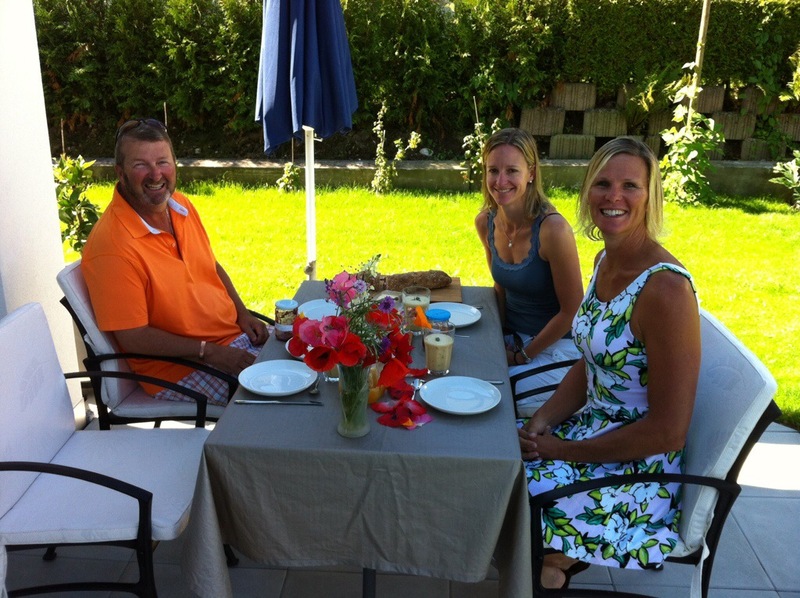 The range was followed by a putting competition on the putting green – Steve & Karin won round one. We had a spot of lunch at the golf club and then it was round two on the putting green – boys against girls and unfortunately the boys beat us by one shot – great fun though. The afternoon was spent lying by the pool reading our books – the temperature was about 30 degrees. 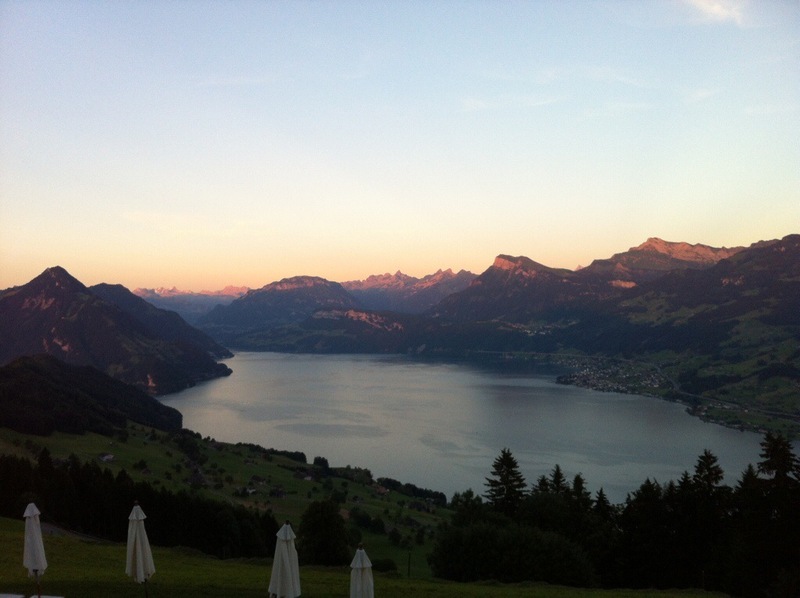 We knew it was going to be a clear night so we had booked the restaurant at Hotel Honegg up on the Bürgenstock overlooking Lake Lucerne. 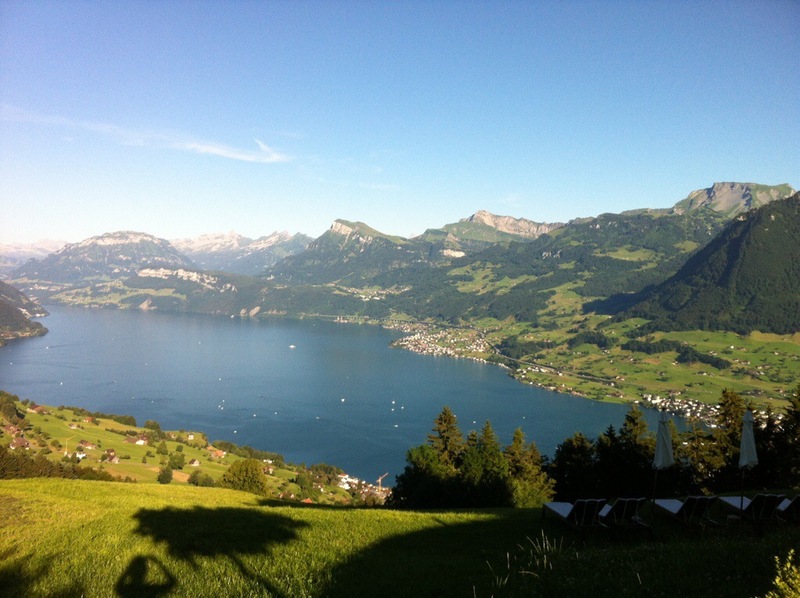 We had called in there on our last trip to Switzerland and it looked lovely. 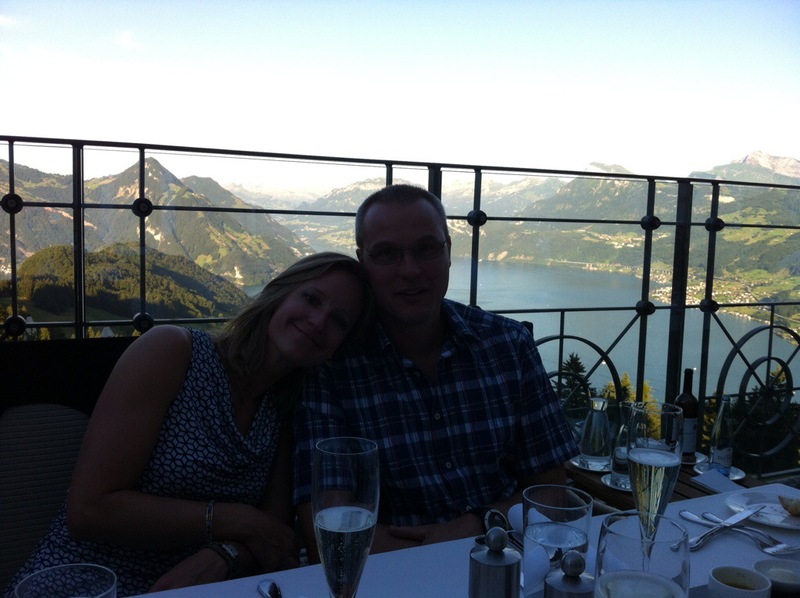 Our impressions were proved correct – it was stunning and we had a great table with a fantastic view. The food and service were also fantastic. It was such a warm and still night – perfect. Over dinner we discussed Christmas and Elvis said he would be keen on a real Christmas tree. A plan was hatched to go undercover Christmas tree hunting in December – camo gear, night vision goggles and all. Steve of course likes the sound of these black op type missions but I am unsure if the reality of going out in freezing temperatures in the middle of the night will measure up. Watch this space in December for further updates on Operation Christmas Tree. In 1905 Emil Durrer from Kerns built Hotel Honegg with 72 guest beds. His uncle was the legendary hotel entrepreneur Franz Josef Bucher-Durrer. The hotel guests came from all over the world and stayed for three to four weeks, partially even for the entire summer. They got taken care of by 15 to 18 local hotel employees. The Hotel Honegg bought its agricultural commodities such as milk and cheese from the Honegg farmers. In 1972 the hotel was closed and all it maintained was a bit of garden production on nice days in the summer. Since 2007 the hotel has been in private tenure. After a renovation that lasted for a few years it was re opened as a five star superior hotel with 23 rooms under the name of Hotel Villa Honegg. Gault Millau (see below) awards the kitchen with 14 points. The menu is acclimatised to the season. The products, like back in the day, are still being bought from local suppliers as well as suppliers from central Switzerland. They also use ingredients from the hotel’s own salad and spice garden. Gault et Millau [ɡo e mijo] is one of the most influential French restaurant guides. It was founded by two restaurant critics, Henri Gault and Christian Millau in 1965. Gault Millau rates on a scale of 1 to 20, with 20 highest. Restaurants below 10 points are almost never listed. The points are awarded based on the quality of the food, with comments about service, price or the atmosphere of the restaurant given separately. Under its original authors and for many years after they left, Gault Millau never awarded a score of 20 points, under the argument that perfection is unachievable. However, in 2004 two restaurants in France achieved a score of 20. There has been discussion about which guide is more important, the Michelin Guide or the Gault Millau. In the 1970s the Michelin’s continued conservative support of traditional haute cuisine was challenged by the support of nouvelle cuisine by the Gault-Millau. Michelin is more popular and therefore more influential, while Gault Millau has been considered more purist due to the main system being based purely on the quality of the food. Gault Millau also has guides for various other countries, for example Switzerland, Germany, Austria and the Benelux.